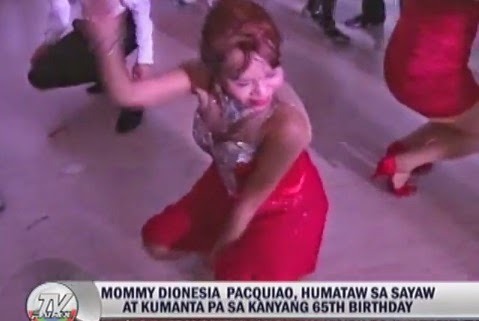 Manila, Philippines - Dionisia Pacquiao, the mother of People's Champ Manny Pacquiao has celebrated her 65th birthday in General Santos last Thursday. Watch Mommy D's lavish and epic birthday bash as she performed 'batalan dance' and has belted out trending version of 'Wrecking Ball'. In a report of ABS-CBN reporter Marc Logan, Mommy D tears up dance floor with her 'batalan dance' as she has rehearsed for long time. Then, she danced an acrobatic. Mommy D also sang chorus part of Miley Cyrus' hit song "Wrecking Ball" with gusto during her birthday bash. She even held a copy of the lyrics while belting out the song.